The wreck had been described as New Zealand’s worst maritime environmental disaster even before the rear section of the ship, lashed by pounding seas, broke away overnight. A CARGO SHIP grounded off the New Zealand coast since October has split in two, spilling sea containers and debris and sparking fears of a fresh oil spill, maritime officials said Sunday. The wreck of the Greek-owned Rena was described as New Zealand’s worst maritime environmental disaster even before the rear section of the ship, lashed by pounding seas, broke away overnight. The ship previously spilled heavy fuel oil that fouled pristine North Island beaches and killed up to 20,000 seabirds, and despite salvage efforts nearly 400 tons of oil remain onboard. Maritime officials said the front section of the wreck remains stuck in its original position, but the stern section slipped at least 100 feet (30 metres) away from the bow and is “moving significantly,” pounded by 19-foot (6-metre) swells. The storm that split the vessel will continue for another three to four days, Maritime New Zealand spokesman Ross Henderson said. Officials said up to 300 of the roughly 880 containers that had been on board were lost when the ship broke apart. Of those, about 30 per cent had been fitted with monitoring devices and some 30 containers had already been located. Oil has been seen leaking from the broken ship. Alex van Wijngaarden, on-scene commander for the national response team, said oil from the vessel could come ashore around midnight Sunday. Environment Minister Nick Smith told reporters that the “risks for the environment are a fraction of what they were in October,” though the roughly 385 tons of oil still aboard the ship is about the same amount that leaked from the vessel soon after it ran aground. Salvage crews previously removed 1,100 tons of oil from the ship. Most of the oil is in tanks in the stern section, which could end up sinking. Some of that oil could end up dissipating in the ocean rather than washing up on beaches. The containers, meanwhile, spilled goods including timber, wool, bales of recycled plastic and bags of milk powder. The debris could begin washing ashore later Sunday. Some containers have been sighted floating up to 20 miles (32 kilometres) northwest of the stricken ship, Port of Tauranga chief executive Mark Cairns said. “They have been caught in a strong coastal current” fueled by the storm, he said. The Rena ran aground on Astrolabe Reef 14 miles (22 kilometres) from Tauranga Harbor on North Island on 5 October. Salvage crews have plucked 389 of the ship’s 1,370 loaded cargo containers from its decks since it ran aground, while some 98 have been washed over board in the past three months. One eyewitness, Warwick Roberts, said the rear section was sliding along the reef. The “stern has reared up and center section is not visible. Large breaking waves observed on bow,” he told the New Zealand Herald website. A two-mile (three-kilometre) no-go zone is in force around the wreck. Investigations by The Associated Press last month revealed that Australian authorities impounded the vessel, but released it the next day after Liberian maritime authorities intervened, essentially saying the ship was safe to sail and the problems could be fixed later. The Rena, like many ships, is registered in Liberia. Some 10 weeks later, the Rena ran full-steam into a well-marked reef off the coast of New Zealand. It’s not clear whether the previously identified problems played any role. The captain and Rena’s navigating officer face criminal charges of operating a ship in a dangerous or risky manner, polluting the environment and altering the ship’s documents after the crash. 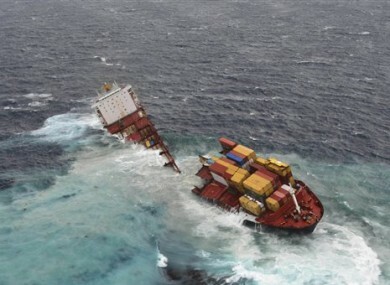 Email “Grounded cargo ship breaks apart on New Zealand reef ”. Feedback on “Grounded cargo ship breaks apart on New Zealand reef ”.